BNN offers a summary of this week’s topical news in a variety of categories: Responsibility; Decline; Inspection; Government; Funding; Fight; Compensation. The matter regarding the increase of wages for doctors and other medical personnel next year is now for the new government to resolve, said Latvian Prime Minister Māris Kučinskis. According to him, there has been an ‘exceedingly strange misunderstanding’ in regards to concerns about the possible non-increase of wages for doctors next year. Kučinskis explains that the three-year budget includes the entry that the increase of wages for doctors is a matter for the next year’s budget. «The increase of wages for doctors is a problem for the next year’s budget to resolve,» said the prime minister. To resolve this matter, Kučinskis says there should be no delays with development and approval of the 2019 budget. Kučinskis stresses that both Healthcare Minister Anda Čakša and the ministry itself have proposals. However, resolution of this matter depends on the new government’s outlined priorities. «If the government decides it is a priority, so it will be. But as the government that will soon step down, we are unable to develop the next year’s budget – the law does not allow this,» said the prime minister. He reminds that increase of wages for doctors requires amendments to the budget law, which have to be carried to the Saeima for approval. «We will develop them. If the Saeima is unable to approve the budget, the parliament will have to approve transition requirements for specific positions of the budget,» the prime minister continues. During an inspection of education institutions and their compliance with green procurement requirements at the beginning of the new school year, the State Food and Veterinary Service found non-compliance with specific requirements in 55 education institutions or 86% of cases, as confirmed by FVS. «We remind that products made in Latvia and that comply with national quality scheme (Green Spoon or Bordeaux Spoon) comply with green public procurement requirements,» FVS explains. The service notes that in all cases education institutions should have made sure products supplied as part of contracts comply with requirements. For some reason, however, no quality assurance measures were performed. After inspections FVS concluded that education institutions were not serious about fulfilling requirements of green procurements. «When companies participate in procurements, they have to make sure the supply compliant green products to education institutions in accordance with previously approved technical specifications,» FVS reminds. Latvian Security Police has commenced an investigation regarding the cooperation between Riga City Council and Russian Giprostrojmost, which is a company under EU and US sanctions. Because the investigation is in its early stages, Security Police refuses to comment on this matter. As previously reported by Nekā personīga programme of TV3, Riga City Council cooperates with Russian Giprostrojmost company, which is responsible for designing the Crimean Bridge. This company is also under international sanctions. In response, Riga City Council’s Transport Department explained that in June, after the Saeima approved amendments to the Law on International Sanctions and National Sanctions of the Republic of Latvia, the department received a letter from the Foreign Affairs Ministry. This letter mentioned that the ban on cooperation with companies applied with international sanctions does not apply to tenders commenced before the approval of the law amendments. The same thing was told to the Procurement Monitoring Bureau. The cooperation agreement with G.B.V., which includes Giprostrojmost, was signed by the department in 2016, before the company was applied with international sanctions. The agreement was signed in relation to the design and supervision over Eastern highway section from Ieriķu Street to Vietalvas Street. According to Una Ahuna-Ozola, representative of Riga City Council’s Transport Department, this is they only active contract between the municipality and Giprostrojmost. There is progress observed in talks with 13th Saeima parties on the formation of a new government. However, more intensive talks are still needed to ensure more clarity in relation to the possible coalition before the first meeting of the next Saeima, says Latvian President Raimonds Vējonis. On Tuesday, 30 October, Vējonis met with KPV LV prime minister candidate Aldis Gobzems, New Conservative Party’s prime minister candidate Jānis Bordāns and Attīstībai/Par! prime minister candidate Artis Pabriks. Candidates informed the president of the progress achieved so far in government talks and future tasks of the government. «Potential candidates did not deny the possibility of working in a coalition even if someone else is picked as the prime minister,» said the president. 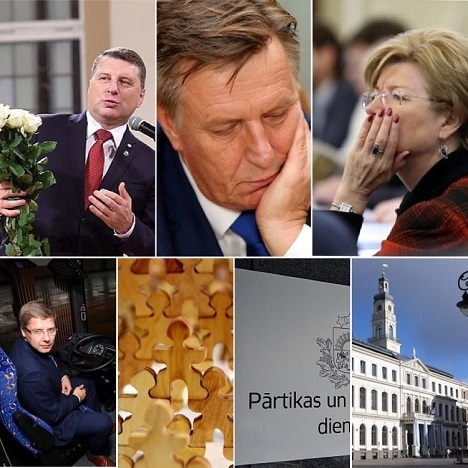 Vējonis stressed that parties elected to the 13th Saeima have to be able to agree on the new coalition and majority support in the parliament, so that it is possible to elect a new Saeima speaker and Praesidium next week. The president admits that considerable progress was achieved in government talks in the past couple of days, outlining the tasks for the next government. «Parties still have to continue intensive consultations before the first meeting of the next Saeima to achieve some clarity about the possible coalition,» said the president. Is there a recovery of deputy quotas? Government in Latvia rushed to divide state budget funds in the last couple of weeks, providing money to different projects: from race licenses to the renovation of hotels for pilgrims in Aglona. Both the prime minister and finance minister claim the government acted responsibly, because it helped relieve the next year’s budget by allocating money to priority directions in advance. Nevertheless, certain cases resemble the urge to provide money to projects that might not get money next year, when the government is set to change, as concluded by De Facto programme of LTV. The money saved in unpaid childbirth benefits to be used for rally, motocross and speedway race licenses. Money unused for grey economy combating project will be provided to churches. The money diverted from the uninitiated Salaspils nuclear reactor dismantling project will be used to finance procurement of equipment and furniture for Ventspils Music High School. These are but some of the examples for the division of state budget funds decided by Prime Minister Māris Kučinskis’ government in the past couple of weeks, De Facto reminds. The influence the current coalition might have in the next government in Latvia will be much smaller. This is likely the reason for the sudden surge in activity. Although the government makes decisions regarding budget appropriation in autumn every year, this time it seems ministers are unusually active, De Facto notes. Riga City Council’s Finance and Administrative Affairs Committee supported amendments to the municipality’s 2018 budget plan. The supported changes increase the municipality’s expenditures to EUR 1.023 billion this year. The meeting was attended by only three opposition deputies, who interviewed the city council’s Finance Department director Ilga Tiknuse. Deputy Vilnis Ķirsis from Unity pointed out the EUR 22.5 million large grant intended for Rīgas satiksme. Tiknuse explained that it is necessary to increase grants for the company because the number of transported passengers has reduced. Additionally, the number of groups provided with discounts has increased. When asked if the company is at risk of going bankrupt without grants, Tiknuse said «that would be going too far», because the company has other solutions. Tiknuse said that together with state grants, Rīgas satiksme will have received grants worth a total of EUR 132.8 million this year. Deputy Krišjānis Feldmans from New Conservative Party asked if it is true that taxes from all Riga residents are not enough to cover RS grants. Tiknuse avoided giving a straight answer. Feldmans also pointed to other budget amendments and asked why there has been a EUR 50,000 reduction of social insurance fees for employees. The city council’s financier explained that over the course of the year a surplus formed because of sick leaves, vacations and other factors. Deputies that were not re-elected to the 13th Saeima will be paid compensations. The total amount will be around roughly EUR 610,374 before taxes, as reported by Saeima’s press-service. The single-time compensation is planned to be paid to 66 deputies. The provisional size of the amount to be paid in total is EUR 610,374. Taxes will be deducted from this amount, as confirmed by the press-service. Saeima deputies whose mandate ends with the Saeima and who is not re-elected in the next parliament is paid a single-time compensation worth three monthly wages.